Some people’s photoshop skillz are remarkable. Not mine, but some other people’s are. Geeky Daddy’s Top 6 “OMG Did They Really Make That Product!? !” List. 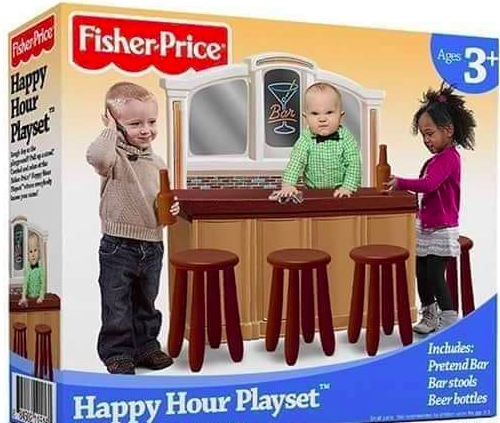 As awesome as this looks and regardless of how much fun it would be to cosplay the final episode of Cheers with your toddler, this is not a real play set. The photoshopped packaging was actually the brain child of a New York City-based branding agency owner and father to a 2-year-old girl, Adam Padilla. His 2016 work was so realistic that it took the internet by storm and created a wave of Fisher Price hate. So much so that Fisher Price was forced to make a statement on Twitter letting people know that they were not in fact selling toddler beer bottles. In all seriousness, having a close family get hauled away in handcuffs has got to leave a dramatic impression on young children. Their little minds must be overcome with a sense of confusion, anger and loneliness. This illustrated book from Picture Window offers age appropriate explanations and illustrations to assist with these difficult conversations. While these exact products are not available for purchase, the packaging is! These hilarious boxes, and many others, are available for people who are too lazy to wrap gifts. In other words, people like me! There is also my favorite: The Extreme Chores Kit for your Nintendo Wii! 3. GameStop Ma’am Customer Funko Pop! By now, most the internet has seen the altercation between the GameStop employee and the transgender customer. If not, here it as..
Somebody better at arts and crafts than I am decided to make a “GameStop Ma’am” Funko Pop! and creatively made it a Target exclusive! I have written before about how I don’t get the appeal of Funko Pops!, but they are hugely popular, so I guess it’s just me. Inspired by some of the crazy flavors referenced in the Harry Potter universe, Jelly Bean decided to release their Bean Boozled: Dare to Compare candies. The Bean Boozled contains two different flavored Jelly Beans with identical colors, such as Buttered Popcorn and Rotten Eggs, and you are unaware which you have until the first bite. Sort of a real sugary Russian Roulette. At my previous job, somebody brought this Bean Boozled product in and we tasted all the flavors. I can tell you, if these flavor engineers had been putting their efforts into the space program, we would have colonized half our galaxy by now. These engineers are that good! While there is a real Star Wars Uncle Owen action figure available, it is not the charred skeleton seen below. There have been lots of Ewok action figures available over the years, however this coughed up clump of cat hair was not one of them. The Force is described by Obi-Wan Kenobi in Star Wars IV: A New Hope as “an energy field created by all living things…” In other words, it is an invisible, intangible abstract concept . But, as we all know, die hard Star Wars fans (like me) will buy anything! Alderaan, the home planet of Bail Organa and his adopted daughter Princess Leia, was famously destroyed in Star Wars IV: A New Hope by Grand Moff Tarkin and the Death Star. As Luke and his friends later discovered, Alderaan was reduced to a whole bunch of floating rocks. Now before you make fun of any Star Wars fan boys that would purchase a box of rocks, remember a ton of people in the 80’s purchased Pet Rocks! What do you think of our list? Please comment and share! If you are not already a Amazon Prime member, follow the link below for a FREE 30 DAY TRIAL! Next Fan Theory Friday: Is Marvel’s Hawkeye A Skrull? I’m still laughing at some of these 🙂 I think I actually gave someone a box of the Jelly Belly beans but I sure wouldn’t take the risk of eating some of those (grosssss)! This is a great list! Hilarious! I’ve seen a few of these products, but never knew the details. Definitely need to find some of those gag boxes! Thanks for sharing. This is awesome! I always wonder about these things being real or not – thanks for taking the time to do the research for us! Jelly Bellies are some of my favorites. I’d be super sad to bite into a delicious looking bean only to taste vomit. But it would be hilarious to watch the face of someone else. . Does that make me a bad person? This was great I saw the bean boozed challenge everywhere in YouTube and I think some of those flavours were horrible. I like the toddler tamers I wish they were real. Haha oh my these are too funny! This list kept me laughing! I would have loved watching mine open the Extreme Chores box and alive tried some of those gross jelly beans-ew! I’ve never seen any of these (even as jokes) but they are hilarious! You definitely have to have a sense of humor for it as some people take things too seriously these days. The book and the bar ones are so funny. If those were real… oh man! My 10 y/o cousin made me play that Bean Boozled game… I got the vomit flavor. I’ve tried those jelly beans before, but some of them I was afraid to put in my mouth! Some of these are hilarious and I’d actually think I’d really like some “toddler tamers” hahaha. These are hilarious!! I really want my kids to have marketable skills and be career focused. So I’ll start em young with a bar to run! I wish it were real! Maybe I need to start an online petition. HAHAHA Some of these are GOLD. Love the sense of humour behind them! Laugh out loud funny, and that doesn’t happen often enough! If I had little kids still and the product was real, I would absolutely buy the little bar! Cheers Cos-play, LOL! The food truck is awesome, so much more fun than a standard kitchen play set. The Jelly Bellys scare me a little with some of those flavors, but I admit to having a pet rock many years ago. LOL. Some items on the list are seriously hilarious! Can’t believe there are actually stinky flavoured jelly beans! ha ha! That Fisher Price bar is so hilarious! I think I want it! These are great! I got a few laughs. Sending this to my husband because he will find this hilarious. This made me giggle. Also, nauseated because I’ve played Russian roulette with those beans. The canned dog food flavored one is the stuff nightmares are made of. OMG what a crazy list! I’d gladly buy the prank toys just for my brothers, LOL! Oh, how they would flip! I love those prank boxes, what a great idea!! And I’ve tried those nasty candies, they are truly AWFUL! That is a big list! I didn’t know about the prank boxes. I also didn’t see anything about the Game Stop altercation so I learned something new today. Those jelly beans though are terrible. But you make a great point about them putting their efforts into the space program lol!